OMG I want to recreate this so bad! Pray tell, what kind of stencil did you use? I used a Stencil Ease Victorian Baroque Wall and Floor Stencil (Amazon link added above). I definitely recommend a wall/floor stencil because they have a repeating pattern for covering larger areas and marks to help you line up the pattern. 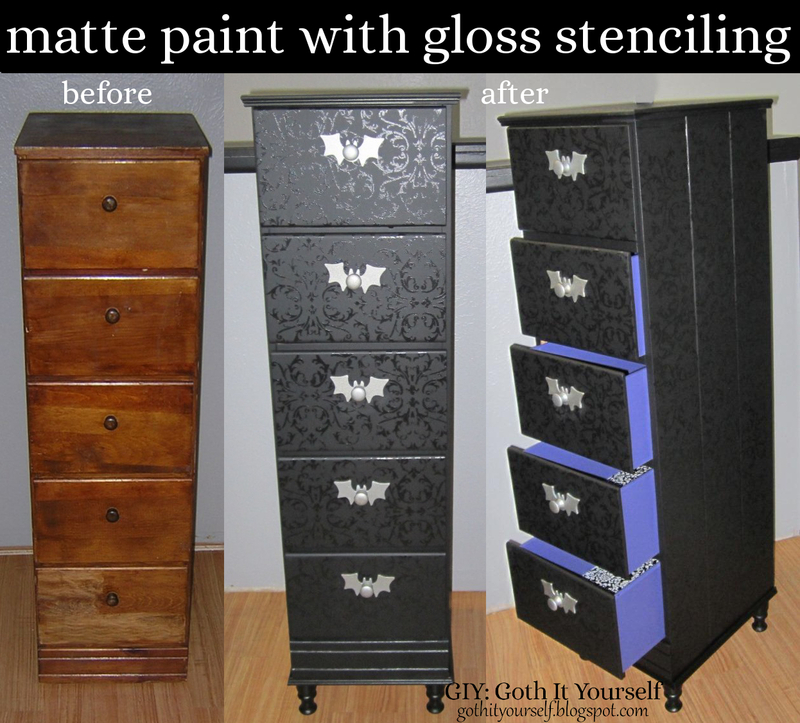 I really love your DIY projects, I can't wait to do a similar thing once I have my own space. 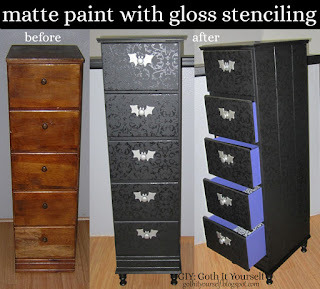 I wish I could find a stencil, like the one you have used. Did you do any prep before-hand, such as sanding the cabinets? I would love for you to make a step-by-step guide so I can follow along. Thank you! I haven't seen the large wall/floor stencils in many stores, but I found lots of resources online. I sanded the chest just to smooth out the dings and scratches, then used a latex primer. I try to do some step-by-step photos, but unfortunately I don't have anyone to take action shots of the process. I edited the post to add a few more details. Spray paint is durable and does not rub off. Thank you! :D I love to hear that my work inspires people. That's my main goal with this blog - to share ideas and inspiration. My first couple of attempts at stenciling looked terrible! The key is to practice (I practice on cardboard) so you know how much paint to load on the roller and how much pressure to apply. You are amazing my dear friend, amazing!!! I love this! I especially like how you added the feet to make it look more high scale. Very clever. That is such a cool paint job! I love it! I was wondering where got the bat knobs, or did you make them? Thanks! Do you apply any kind of finish to your pieces to help protect the paint from scratching? I have used polyurethane on some of my furniture pieces. However, I did not use any clear finish on the gloss-over-matte pieces because I thought it might diminish the contrast of the gloss and matte.